Geocoding is the process of transforming a postal address to a spatial location on the Earth's surface. The resulting locations are output as numerical coordinates with attributes, which can be used for mapping or spatial analysis. Locations need to be accurate so that telcoms can determine what services are available to a given house or business. An incorrect address could lead to wrong assumption that customer is not in a service territory. It could also lead to repair troubles or difficulty in installation of new equipment or services. TimelyBill first verifies a customer location by matching it with a USPS standardized address. 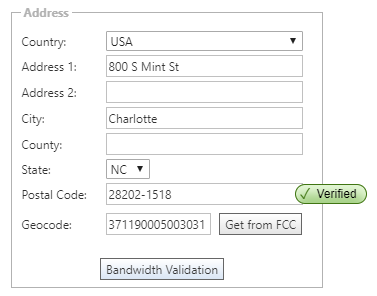 Next, our integrated FCC geocode lookup tool provides the coordinates as well as the census geographies (state, county, tract and block) associated with address.